The purpose of this post is to enlighten the climbing tribe with some general information about rock climbing in Mallorca. Unlike places like Kalymnos & Leonidio, Mallorca is hardly featured as a popular rock climbing area on 8a.nu. This is not a concern as climbers prefer to do their thing in peace and not queue for routes in crowded crags with polished footholds. The cool thing about Mallorca as a climbing destination is the fact that you can frequently find yourself in an area with very few other climbers – whether that is an advantage or disadvantage it is for you to decide. In terms of conditions, apart from the high humidity, the fact that we enjoy an average of 300 days of sunshine is enough to make the island (in my humble opinion) one of the best places for sports climbing in the world. The quality of the rock has been acknowledged by a number of prominent climbers. The variety of scenery and styles is mind-blowing. It is literally packed with good crags and infinite potential for new development within wise boundaries. Besides dipping into the sea after a climbing day is pretty hard to beat. A good example of the epicness of the rock is the incredible Rigor Mortis & To Pa Ti walls at Puig de Garaffa climbing area. A mix of lime and sandstone, this piece of natural artwork is so unique, one feels like never leaving until sending all of the routes that have been created there. It’s truly obsessive. When we say variety we mean it. Limestone goodness in all shapes and forms. 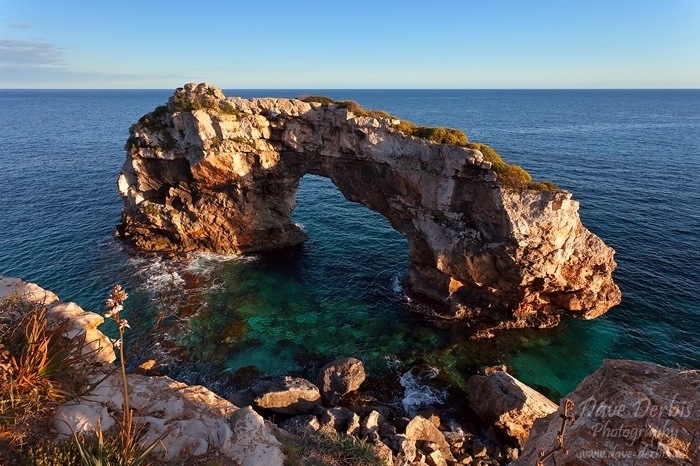 It is incredible how many different styles are concentrated on the surface of this Balearic wonder rock. Most of this just 40 min away from any given location on the island. This I call top conditions for getting into the high end of the all-round climbing game. Yes, you read right – Bouldering. There are a bunch of super psyched boulderers that have developed several areas. Crashpad rentals and guides are available via our website. If you are a big group tired of 7 days of sports climbing or DWS you might appreciate a night camping in the mountain forest, trying the local boulder problems. There are enough bolting fanatics here to keep us always excited and busy with new projects. A fair amount of routes are not featured in the official guidebook, usually being above 7a. The old crags get re-bolted and maintained by the community but clearly, everyone should use his/her own discretion when it comes to trusting bolts. The quality of the routes is quite high. The grading in Mallorca is kind of hard which is not a bad thing at all! The setup in terms of bolts – mostly expansion and some glue-ins is the way around here. There are a number of Spanish style gyms on the island. The newest is EsCau located in Palma and the one in Inca is called EsRocodrom. Probably the best way to get to know local climbers and ask for beta, that’s if you speak Spanish, would be visiting one of those two gyms. If not, you can also post on Escalada Mallorca / Climbing Mallorca facebook group to ask a climbing related question or find a climbing partner. Many use this group and it helps them team up and get the most out of their trip. Gyms in other locations on the island: Palma – Doble Ocho, Manacor, Pollensa, Esporles, and Valldemossa. When it comes to buying gear there are few options – Foracorda, the shop in the gym in Inca (EsRocodrom), Decathlon and Intersport Kenia. The logistical part of coming to the island on a climbing trip is what keeps it a low key destination. It is quite a mission to find affordable accommodation or campsites. Going around the island requires car hire and those can be pretty pricey especially in the high season. If you are coming with your own vehicle taking the ferry hits your pocket too. It just seems like more costly and hassaley to come here instead of mainland Spain in places like Siurana and Chulilla where you have a big carpark gypsy communities, affordable food, and hostels and often you don’t need to drive to the crag. That is one of the reasons why Mallorca will never be a crowded climbing destination. There are simply no facilities dedicated to the rock climbing tribe. The tribe that would never go into 4-star hotels in beach resorts and drink mojitos in Arenal and Magaluf but rather buy from the local shop and hang out in the village bar. Of course, nothing can stop a determined climber and anyways, having it easy is not what defines the rock climbing community. Harder just means more rewarding. If you need specific advice on the best locations to base yourself don’t hesitate to drop us a message. We would be more than happy to help in any way we can! The high diversity of the climbing crags and climate creates a natural division of winter and summer crags. In the hot season, the local community moves to the high places on the island. The chilly Tramuntana welcomes its need for lower temps. There are a few shady places around Palma too. In winter people move to the coastal crags with breathtaking views and caves. It’s just an infinite amount of climbing bliss. Every season we get psyched on a different crag. The island is the birthplace of Psicobloc aka Deep Water Soloing developed by Miguel Riera, a local active guide based in Sóller. The style truly grabbed the attention of the climbing community after the sendage and release of the climbing film “King Lines” (BigUp Productions, 2007) where Chris Sharma broke through another level of climbing radness and essentially showed what the island has in store. By the way, only Jernej Kruder has repeated the Es Pontas route so far. The island attracts a fair amount of rock climbing celebrities, in 2018 Paige Klaassen, Margo Hayes and Emily Harrington visited and had some girl power rock climbing fun documented in this video. The island is also home of the prominent Spanish climbers born in the Basque Country Eneko and Iker Pou who are also developing lines and contributing to the positive vibes in the community. I’ve been diving deeper into the rock climbing lifestyle of Mallorca for more than 2 years now. Every month I discover something new and exciting not only about the rock but also about my inner journey and the people I share it with. I have a lot of friends from abroad who have merged with the local scene and can’t imagine living outside of this paradise for rock junkies who refuse to live away from the sea. Every day is made special by the unique gifts the island has in store for us. This article was inspired by the need to share this knowledge and experience. If you need guiding services for DWS, Multi-pitch, Sports, and Bouldering let us know and we will provide you with a wide range of availability and prices so you can make the best choice. Our online service saves you communication and price comparison hassle. Free of charge! For mind-blowing footage of Mallorca’s beautiful nature follow us on Instagram (balkan_vagabondz).